Riichi Mahjong is one of the most popular variant in the world which unlike most variants, Riichi Mahjong emphasises on concealed hands and defense. It may be relatively easier to pick up Riichi Mahjong as compared to Taiwanese Mahjong or Mahjong Competition Rules (MCR) as Riichi Mahjong use the scoring of 1 fan to 13 fan system. In Riichi Mahjong, they call fan as han and are used interchangeably. However, as mentioned, Riichi Mahjong emphasises on concealed hands, so winning patterns are higher in value when it is concealed. As such, one has to memorise the hand value when it is concealed and when it is not. As long as you have melded even 1 set, your hand will be considered melded. 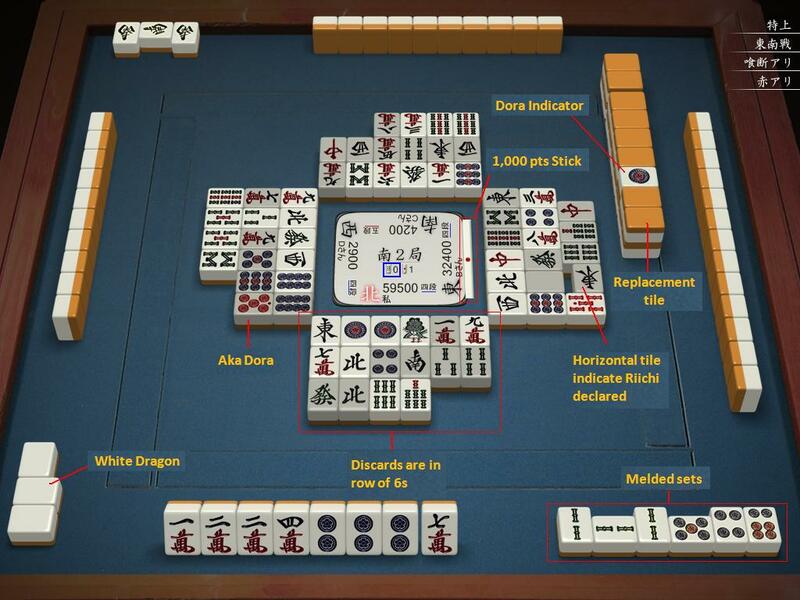 Before going into such a tedious task, let’s take a look at how similar the winning patterns (yaku) are in comparison with that of Singapore mahjong. As you can see, all patterns you are familiar with in Singapore Mahjong are present in Riichi Mahjong and its han value is the same except for a few. Certain patterns are relatively a lot more difficult to form when concealed. This difficulty garners an extra Han. As such, a concealed Half flush (3 han) is 1 han more than a melded Half flush (2 han). Likewise to full flush. In addition, a melded Full flush is 1 han more than that of Singapore Mahjong. It is important to know the difference of Han and Yaku and is a frequent confusion even amongst players who have already know Riichi Mahjong. Yaku is a hand winning pattern and gives a minimum of 1 han for your win. Han is a form of scoring unit. For example, All Pungs [対対和] (Toi-Toi) is a yaku but it is worth 2 Han. Yaku is NOT a han. It is important to note that there are no animals or flower tiles in Riichi Mahjong so there is only one type of Ping Hu. On the contrary, because it is way too easy to do a melded pinfu, Riichi Mahjong does not award this yaku any value. Singapore Mahjong style players attempting pinfu have to be careful to always keep your hand concealed. The conditions for Pinfu in Singapore Mahjong and in Riichi Mahjong are the same – 2 sided wait, all chows. The only exception for Riichi Mahjong is that, the 2 sided wait is NOT in formation of a pair (eyes) whereas this is allowed in Singapore Mahjong. For clarification purpose, using a pair of honours that is neither your seat wind nor round wind is considered Pinfu. This hand is still considered Pinfu. Once you understand the similarities between Riichi Mahjong and Singapore Mahjong, you will definitely need to learn the below 3 yaku before you are considered playing Riichi Mahjong. A pattern that do not consist of any terminals (1/9) or honors tile. This is one of the easiest way to win as you can pung or /and chow without worrying. New players who are not comfortable with going concealed can adopt to aim for this yaku to win. This is however, not the best way to play about. All 4 sets + a pair of your hand are self-drawn. This can be count as a yaku on its own. While it may make no sense to win via only Menzen Tsumo, it is not uncommon to see this. The root of Riichi Mahjong, is to declare Riichi or in short, to Riichi. To Riichi, your hand must be concealed and in Tenpai [聴牌] (Waiting for the 14th tile to win on). This is the most delicious yaku to go for because Riichi itself gives you yaku without a worry. New players simply have to endure the tendency to meld and declare Riichi for a simple play. You can do a Kong (Kan) provided you DO NOT change the shape of your hand. With these, you are more than half way able to play Riichi Mahjong. Follow what you know from Singapore Mahjong while knowing the difference then apply the 3 important yakus into play. It’s “Simple”, remain “Concealed” and Riichi! Riichi Mahjong is the only variant with a tile being revealed when it is still in the wall. In Singapore Mahjong’s context, this is the “flower wall”. If you notice, there are only 4 tiles available for replacement. As there are no flower or animal tiles in Riichi Mahjong, players will only replace their tile upon a Kan. This also translates that a 5th Kan can never be carried out in Riichi Mahjong. The tile revealed is called the dora indicator. In this case, since the indicator is 4 man (character), the dora is hence 5 man. This is deduced by following the chronological order of mahjong suits. Numerical tiles will follow the numerical order of 1 to 9. Eg: If the indicator is a number 9, the dora will be 1. A dora adds fan into your hand value if you use it to win. If you have pung a set of Red Dragon (Chun) while Red Dragon is the dora, you get 1 han from a set of Red Dragon as a yaku + 3 han as dora = 4 Han in total. Important: Dora is not a yaku. You cannot win if your only han comes from dora. Hence in many cases, you will encounter people’s hand with riichi as its only yaku + doras. To be able to build big hands easily, players have to learn how to incorporate doras well into their winning hand in order to boost its values. This is 1 challenge many Singapore Mahjong players might face as they are too used to getting Han from animals and “own” flower tiles effortlessly. Beside this kind of doras, there are 3 more other kinds of dora. In a typical Riichi mahjong set, you will always find fully red coloured fives. Although there are 4 in each set, most rules typically only have 3 of them. Red dora is the easiest to use being the number five. Whenever a Kan has taken place, a new dora indicator is revealed beside. We call this new dora indicator, the kan dora indicator and the new dora is known as kan dora. As you never know what is the Kan Dora, it is an effect that other players can benefit from and hence only adivisable to Kan strategically. “Ura” in Japanese means behind or back. This tile is situated below the dora indicator (includes Kan dora indicator) and is to be revealed only via winning after declaring riichi. Winning a hand without declaring riichi do not get Ura Dora. Getting Ura Dora can be very luck-based but it acts as an extra incentive to declare riichi. With Ura dora being doubled if a player has done a Kan, it is strategically unadvisable to Kan when someone has declared riichi or making Kan when you are far from Tenpai (Waiting). This is something important Singapore Mahjong players have to take note as we are all Kan lovers. Pressurise players to defend and at least slow their hands down. This lengthens the round, giving you more opportunities to draw your winning tile. A yaku that is only valid when you declare Riichi. If you win within a set of uninterrupted turns (Nobody calls), you get an additional 1 Han. We are done with more than half of the main ideas in Riichi Mahjong! What is left are minute differences which are best explained with an overview of a game picture below. Riichi mahjong have their discards organised in an orderly manner. This give you clues about what tiles your opponent might possibly need and hence defend against it. As mentioned before, Riichi mahjong emphasises on defensive and concealed play. If your hand is concealed, it is actually not easy to pinpoint what tiles your opponent need. In Riichi mahjong, all your discards have to be identified (for a reason explained later below) and this includes discards that have been used to complete your opponents’ meld sets. The position of the tile indicates the player who discarded it to you while the horizontal tile indicates the tile that is discarded. In the above case of ,it was placed horizontally in the middle meaning the player opposite discarded this tile to you. For chow set, although it is definite that you will place the tile on the left, it is still as crucial to know the tile discard. In the above chow set, is the tile discarded by the player on your left. In an event of an An Kan (not in the picture), the new Kan Dora indicator is flipped before drawing your replacement tile. Your An Kan tiles will be placed at the side of the table lying flat in the formation below as an example. The last important rule you have to be aware of when playing Riichi Mahjong is called Furiten. When you are in Furiten, it means you cannot win off from other players’ discard. Furiten means that 1 or more amongst your list of waiting tiles has been discarded by you before. You are waiting on . Your discard pool has . This tile is among your list of waiting tiles and hence you cannot win from players’ discards. To make sure you are not in Furiten, you have to be aware that NONE of your waiting tiles has been previously discarded by you. Important: You can self-draw win even if you are in Furiten. It is not unusual, even for professional players to declare Riichi with 3-sided wait when they are in Furiten. The above example is a common Furiten situation revolving Suji [筋线牌] (3 Numerical sequence of 147, 258, 369). As a result, many learners will not be certain whether if they can win on for example 5 or 8 if they are waiting for 5 or 8 but has a 2 in their discard pool. This is a very common misconception. Please bear in mind that Furiten is not referring to Suji. Quoting from above, “Furiten means that 1 or more amongst your list of waiting tiles has been discarded by you before. ” Below are 2 more examples of Furiten that are non-Suji related. You are waiting on , , but is in your discard pool. Therefore, you are in Furiten. You drew a but you have no yaku and unable to win and hence force to drop this . Therefore, you are in Furiten. This can be a common result when you start melding his hand before making a pung of your . If you decide to fix on winning with 1 yakuhai as your only yaku, it is important consider a possibility of getting yourself into Furiten before you start melding. A way to avoid this is to make sure the pair used no longer has the available tiles to form a triplet. Congratulation for completing Part 1! If you are comfortable with the above rules, you are qualified to join us for a session! Hello, I am trying to contact Mr Edwin Phua. Will you be able to help? Thank you very much. Hello Ling, could you send us a message at https://sgriichimahjong.com/contact-us-2/ ? I will direct it to him for him to get back to you. Hello Feng, I have dropped my details and message in the link provided. Thank you very much.